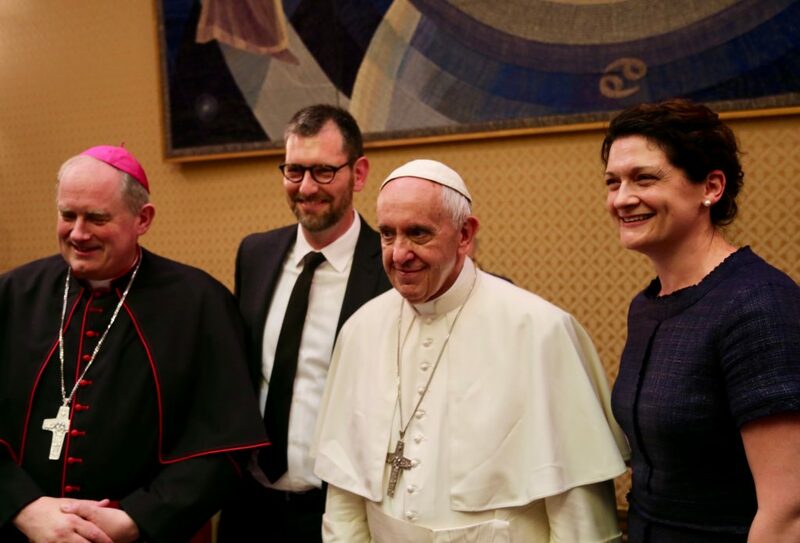 Jay Pathak, a pastor at Mile High Vineyard Church in Denver, Colorado, and a member of the John 17 Movement, took this picture of Bishop Peter Smith, Eric Shreves, Pope Francis and Hillary Shreves. Eric and Hilary Shreves and Bishop Peter Smith (all Vancouver-Portland) had the chance of a lifetime in June when they traveled to Rome for a two-hour meeting with Pope Francis. On Thursday, June 8, they gathered at the Vatican with a group of about 50 people, mostly evangelicals and Pentecostals from the US, for a free-flowing discussion punctuated by praise and worship. Most of the participants are part of the John 17 Movement, a grassroots Christian unity organization based in Phoenix, Arizona. For Eric and Hilary, the journey to Rome began with an out-of-the-blue phone call from Josh Butler. Josh is a friend of Eric’s and a pastor at Imago Dei Community, an evangelical church in Portland. In a joking way, Josh explained that he had tickets to a party he wanted to invite Eric and Hilary to—a special party with Pope Francis. They had two days to decide—two days to arrange childcare and reshuffle their work schedules. The Vancouver-Portland branch and People of Praise headquarters agreed to pay for their trip, as well as for Peter’s. Inspired by that experience, Josh had returned to Portland and called Eric, a Catholic, and the two had met several times for coffee and meals. Eric had introduced Josh to Peter and to Joel Kibler (also Vancouver-Portland), and Josh, in turn, had invited Peter and other Catholic leaders to a gathering at his church. All of that led up to Josh’s invitation on the phone. During the meeting, Josh had a chance to update Pope Francis on the steps he had taken in Portland to build unity. What an incredible story of what the Holy Spirit will do to bring deeper unity to his church! Thanks to all who have said yes to the Lord in living an ecumenical life in the People of Praise and making this quite historic meeting possible! I am built up in faith and so encouraged at all the Lord can and will do in our life together.